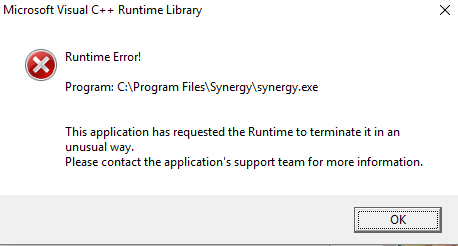 Synergy crashing when starting under Windows 10! I get that error when starting Synergy and it instacrashes. I tried uninstalling and reinstalling, repairing, yet nothing works. Windows 10 x64, latest updates installed. What Synergy version do you have @IceprincessOCN? Can you try v1.9.0 from Download Synergy 1.9.0 to fix the wifi macOS bug forums thread? Looks like that worked! What was the problem, anyway? It could be the serial key corruption bug. v1.9.0 has the fix for that. Thanks for the update @IceprincessOCN.